LONDON (ICIS)--Supporters of globalisation as we know it will be able to celebrate at the end of 2017 when the world they treasure will be in a much better state than it was at the beginning of the year. Exactly a year ago, after the UK’s vote to leave the EU was still being digested by the other 27 EU countries and Donald Trump had just won the US Presidency having promoted protectionist policies, it did look like the global trade system was on the brink of collapse. The European chemical trade group Cefic released a statement the day after Trump won stating that the companies it represented should stand prepared to brace themselves for a “different world” in trade and environmental policies. It is worth remembering those words now. They denoted the expectation – and some hopes – of something the world had not seen in decades. 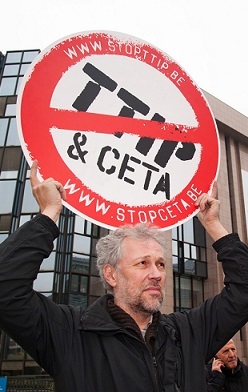 “Today [9 November 2016] we have again woken up in a world that will be different to what most people expected... what we do know is that both climate policy and international trade will operate in a very different environment,” Cefic’s director general Marco Mensink said at the time. Whether Cefic would have liked a ‘rebalancing’ of European policies, there has not been much of that since Trump won the Presidency. For that matter, nothing at all has changed much. In reality, nearly one year since Trump got into office, the world’s trade system remains practically unchanged and the EU claims it has now become its guardian. Trump did sign the withdrawal of his country from the Transpacific Partnership (TPP) soon after coming to office, but that free trade agreement (FTA) had not come into force yet. By the end of 2017, the other 11 countries taking part have just decided to power ahead without the US. Barack Obama’s ‘pivot to Asia’ has definitely been undone, but most analysts see this more as a disadvantage to the US. Negotiations are underway to reform NAFTA, the US’ FTA with Canada and Mexico, perhaps a wise decision for a 24-year old deal. However, the pressure from industrialists and Republican party members has made it clear that the accord will hardly be ‘torn apart’ as Trump had lambasted during his campaign trail. Those in Europe who were bracing for a “different world” post-Trump can rest assured that, for now at least, things have settled down in the manner they could have not imagined 12 months ago. “It is true that a year ago we thought we should brace for a different world. Protectionism is always an issue for our industry – the European chemical industry, for example, exports 25% of its production to overseas markets. We have seen upheaval in some sectors, like the steel industry, but overall the EU has managed to maintain a free trade policy agenda,” says Rene van Sloten, the executive director for industrial policy at trade group Cefic. By upheaval, he meant the steep tariffs the EU has placed on Chinese steel, a move that was still considered shy of targets by that industry’s trade groups. Accommodating everyone within free trade policies was never an easy task. “Over the last year, the EU has signed a series of trade agreements – CETA with Canada entered into force and we reached a political agreement on an FTA with Japan. The EU continues negotiating an upgrade of the existing FTA with Mexico and a new one with Mercosur [Argentina, Brazil, Paraguay and Uruguay],” continued Van Sloten. The fact that the European economy has powered ahead in 2017 has also helped, as social discontent has somewhat abated on the back of strong employment growth figures. However, far-right parties continued marching to national parliaments with confidence in key countries like Austria, Germany or the Netherlands, some of the best performing economies – not precisely a bright prospect. Cefic’s Van Sloten went on to say that the “turbulent” 2016 had left a mark on policymakers, who were placing more attention on social and environmental issues when designing FTAs, or the antidumping methodologies applied to sectors like steel. “However, I don’t regard these as very problematic [to continue developing free-trade policies],” he said. The EU may face in 2018, however, a trade policy challenge - Brexit. While the negotiating party with more to lose remains the UK, the country – which is set to leave the EU on March 2019 – is still hopeful it will be able to negotiate some sort of FTA to continue commerce with its largest trade partner. However, too many question marks remain about the sort of FTA the EU and the UK will sign, as well as doubts over regulation, after more than 40 years of regulatory convergence. Both Cefic and its UK peer the Chemical Industries Association (CIA) have lobbied hard during 2017 to keep trade in their industry intact post-Brexit, but this is a most unlikely scenario. The CIA can attribute to itself praise for its efforts to visualise how important chemicals are for UK’s manufacturing. However, a potential EU-UK free trade deal will have to prioritise some economic sectors over others, and the powerful services industry – with its financial services included – are likely to be the biggest winners, while the already-small manufacturing industry may end up on the losing side. Doubts about chemicals’ regulation also remain, and a year-and-a-half after the UK voted to leave the EU corporates are still unsure of what regulatory environment they can expect with Brexit. “One of the big unknowns going forward is what’s going to happen with ECHA [European Chemicals Agency]. Will the UK set up its own chemicals agency or will it seek to cooperate with ECHA? I am afraid it is too early to know that,” concludes Van Sloten.